We've updated the official BryantParkNYC playlist on Broadcastr with original recordings taken during last summer's Word for Word Poetry series at the Reading Room. Find them under the Featured Tab, or search for Bryant Park. You'll hear Sandra Beasley, Patricia Smith, and poetry legend James Tate reading their poems and talking about the writing process. And we knew it wouldn't take long for the lawn to be tagged with a war story from our summer film festival. Check out the aptly titled Running of the Blankets from Clayton Early of the Harvard Sailing Team sketch comedy group. 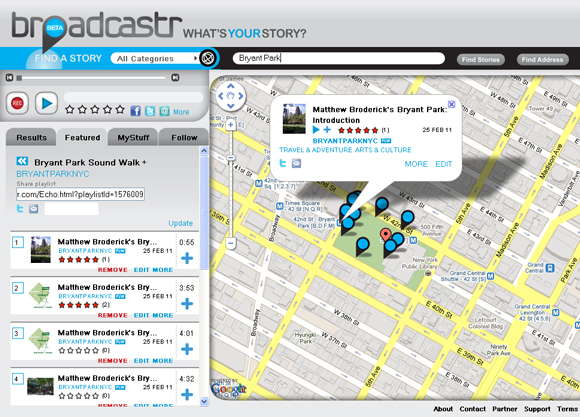 Now, why not add your own Bryant Park story? 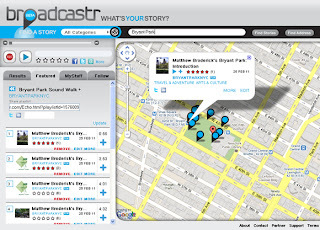 For listening and recording on to go, head over to iTunes for the free Broadcastr App.